As you can see in my previous post, I’ve been recently obsessing with one of my favorite Australian designers, Ellery. When I first saw her FW17-18 collection, I entirely fell in love with the oversized structured checked coat that opened the show. And I got lucky enough to wear it for my shoot in the dreamy Four Seasons Hotel George V.. When designing FW17 collection, Kym Ellery has been particularly fascinated by the dress codes of bourgeois parts of Paris, notably Avenue Montaigne, known as La Grande Dame of luxury shopping destinations. 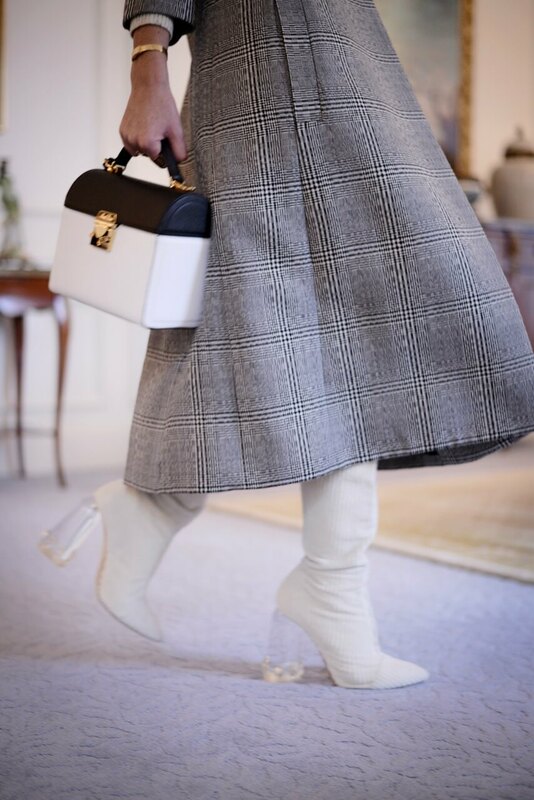 Her references are evident in this Prince of Wales- checked coat which reminds me of a mix of Christian Dior’s New Look in 1947 and the business-first aesthetic that is recently taking over fashion shows and streets of Paris and other fashion capitals.. The perfect example of Ellery‘s skill for reinventing tailoring, this Glen check coat offers a new take on power-dressing. It’s cut from black and white Prince of Wales-checked wool to a double-breasted shape with wide peak collars and four buttons. 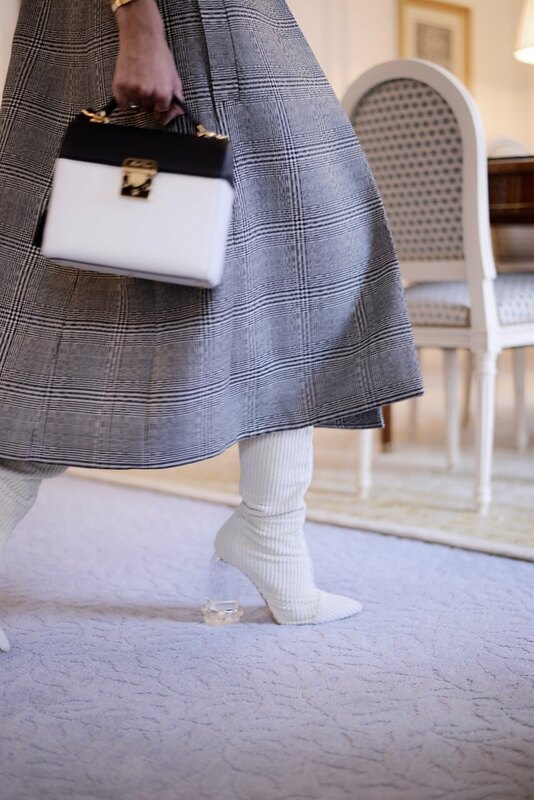 Even if it seems like borrowed from your man’s closet because of its structured architectural cut, it enhances your femininity with the way it moves and flows like a dress when walking. This coat is perfect when you want to feel powerful and feminine at once..
To add extreme femininity to the masculine cut of the coat, I paired it with some endless Ellery’s extremely high over the knee boots in ivory corduroy velvet. Definitely boots worth to invest in if you want to make a statement. 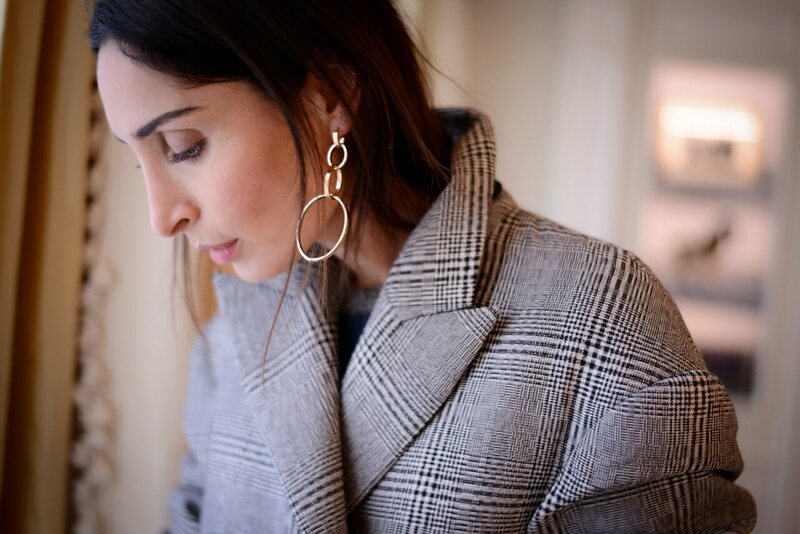 To finish off the look I wore my latest bag crush, Mark Cross ladylike structured bag and my all-time favorite Vita Fede earrings..
Oh my, this look is fantastic! Love it all, especially the boots! Spectacular! Wow this outfit looks too cute! Love it!